The Hajj Exhibition at the British Museum is viewed as a great dawah opportunity by many Muslims. As far as I’m concerned it’s a propaganda piece for the House of Saud project & it’s Orientalist backers. After much cajoling by friends, I finally bit the bullet and decided to attend the Hajj Exhibition in London, more as an excuse to catch up with old friends and less to actually have my own religion and history explained to me. For years I’ve avoided the British Museum, despite its new atrium and the sheer wonder of it’s architectural splendour, it’s the contents of the building that trouble me. The swag, the loot, the filthy lucre, centuries of ill gotten gain courtesy of the British Empire looting and pillaging from every known corner of the globe, for King, Queen & Country dear boy. Instead of talking about the importance of the Hajj or what the central role of Mecca is to Islam, why would they (the backers of the exhibition) choose to talk about Harry St. John Philby? Harry St. John Philby, as the blurb said, was among one of the first westerners to enter Mecca (pretend to be a Muslim) to undertake the Hajj and to see what it was that drives Muslims to carry out the pilgrimage. What it didn’t tell you, and what most people would just walk right past without noticing is that Harry St. John Philby was a spy who worked for the British Military Intelligence. His progeny would be one Kim Philby, who would work the same field as his father and end up being exposed as a double agent working for the KGB. As we continued down the exhibition path and my disdain beginning to recede somewhat, I noticed there was an entire section on the “Arab Revolt”. The Arab Revolt that was created by men like Philby & Lawrence (of Arabia) of the British “Mesopotamian Expeditionary Force” to launch an armed uprising against the Caliphate. I’ve written before about Abdul Aziz ibn Saud the bandit chieftain & his marriage of convenience with Britain to destroy the Islamic Empire. The exhibition glorified the terrorist attacks like the destruction of the Hijaz Railway, that ran from the centre of the Caliphate, Istanbul to Damascus and onto Medina. The exhibition then took great lengths to show how great the Saud family was by demonstrating the railway line they built in it’s place some hundred years later. So what you have is a foreign superpower (Britain) effectively aiding, abetting and installing by means of outright terrorism, a puppet regime that will favour it (sound familiar? Libya, Syria) whilst destroying the Islamic Empire at the same time. This very same regime today preaches the message of obeying your leaders, whilst being formed on the exact opposite. It’s always been the Orientalists dream to understand the strength of Islam and what drives Muslims. Once they figured it out, they could subtly deconstruct that core element to drive their own agenda. For example we have London’s SOAS University , which was created with a remit to train the future leaders of the former British colonies to run them just as their past colonial masters had done so. It’s no coincidence that Mirza Tahir Ahmad, the former leader of The Qadiani’s was trained at SOAS. You can read about the Dönmeh connection to the House of Saud in Saudi Arabia in a report titled “The Emergence of Wahhabism and its Historical Roots,” dated September 2002 and released on March 13, 2008, by the U.S. Defence Intelligence Agency. You can read Said Nasir’s book, ‘The History of the Saud Family’, where it’s maintained that in 1943, the Saudi ambassador to Egypt, Abdullah bin Ibrahim al Muffadal, paid Muhammad al Tamami to forge a family tree showing that the Sauds and Wahhabs were one family that descended directly from the Prophet Mohammed SAW to strengthen their legitimacy as rulers. You see it’s not that difficult to run counter propaganda. The truth is that many Muslims are ignorant of their own history and religion. For a religion that was unveiled with the words IQRA! (Read!) we as a people know little of Islam nevermind the knowledge of our history or the treachery committed by those who garb themselves in cloaks of respectability and piety. A people who don’t read will fall for anything. It seems that Qaisra Khan, the project curator of the Hajj Exhibition at the British Museum has read what I’ve written and has labelled me an extremist for writing this blog. I am willing to share a platform with Qaisra Khan or anyone from the British Museum if they wish to debate me on what I’ve written. When’s an election not an election? When that election is an American sponsored farce in Yemen. While the people of Yemen risk life and limb in a year of bloody protests, the Sauds & the US carry out a “show election” for a new president. With their being only one candidate standing unopposed, how do you expect Abd-Rabbu Mansour Hadi not to win. There wasn’t even a Yes or No option to be had on the ballot, the only vote was for Hadi, the only vote is a YES and there’s no chances he can lose. This new dictator was vice president under Saleh for 17 years and while Saleh kicks back after his 33 years in charge, in New York under his immunity deal, his right hand man runs the country, while his family control the security apparatus. You have to love the hypocrisy of it all. I’m drawn between tears and laughter as to how exactly has Yemen become the model for peaceful transition that the Obama administration proclaim it to be. Predictably, the corporate media has avoided coverage on this issue but chosen instead to focus on Putin’s fixed election in Russia, a tactic to deflect attention away from the role of “The West” in Yemen. Regular readers will now of a previous blog “Chaos in Yemen today is a direct result of The West’s secret war fourty years ago” which outlined the powerful and corrupting effect committed by Britain in Yemen. The fallout in Yemen has been instant, whilst America’s kleptocracy’s applaud the sham election the change that was wanted has not transpired. 85 deaths on Monday and another 185 dead today . This will of course be written off by the corporate media as being uppity Al CIAda types opposing democracy and freedom, what it really shows is that the US & her stooge elements want neither peace or stability in the region. If they did, they would allow a full election with more than one candidate. The only place where democracy is acceptable, is where America’s candidate is electable. Just like Obama himself, this is another change that no one can believe in. The first episode “Who Pays Wins”, tells the story of one Colonel Sir Archibald David Stirling, World War II British Army officer, founder of the Special Air Service and Mercenary. Worried that Britain was losing its power after the War, Stirling organised deals to sell British weapons and military personnel to other countries, like Yemen & Saudi Arabia, for various privatised foreign policy operations. Stirling along with other associates formed Watchguard International Ltd. He was also linked along with an associate Denys Rowley in a failed attempt to overthrow Gaddafi of Libya in 1970/71. In my article last week “Syria, UN Resolutions & the Bigger Picture” I attempted to show the wider strands of the dirty game being played in Syria. I’ve been accosted by many who feel that I’m somehow Pro-Assad as I am lacking in my revolutionary zeal. The rather unfortunate truth of a manufactured regime change carried out by Muslims, ostensibly for the benefits of “The West” and her client states in the Middle East, is lost upon the people. It is this exact cold hearted realism of RealPolitik that Muslims, rightly or wrongly lack. Unable to take a step back from the images of death and destruction the mass media pepper us with in their quest for humanitarian intervention (a lie exposed last week) that makes us jump in two footedly without thinking first. It is the kindness we have for our fellow Muslims that is being exploited. That’s not me being cold hearted. That is what the enemy sees of us. Do I support the rebels and should Muslims in “The West”? If we’re dealing in black and white answers, then the answer is a resounding yes. Can we add conditions to our support? Crucially, do we have any say on what replaces the Assad regime? Whether you wish to accept it or not, the opposition in Syria are sponsored by the US, Britain, France, Saudi Arabia, Qatar, the Muslim Brotherhood, the Syrian National Council, assorted ‘activists’ in exile, some closely linked to the British Foreign Office and the US State Department. All of the players involved in this tragedy are like Saul on the road to Damascus, their agenda’s vary but they all converge at one point: their determination to destroy the current government. For “The West” – Britain, France and the US – the elimination of a government and a political party that has long got in their way is the issue. For the Muslim Brotherhood, the issue is revenge for Hafez al Assad’s repression of their revolt in 1982, the destruction of a secular government and perhaps the installation of a new system which they expect to dominate. While the BBC are pushing the narrative of an all out sectarian civil war in Syria amongst Sunni’s and Shia’s, the fact that Syria has been dominated by the minority Alawis as the ruling elite politically & militarily since the 1960’s is strangely absent from discourse. A conveniently forgotten fact. For the US and their client state Saudi Arabia – Iran, Syria and Hizbullah are three parts of the same problem. The Saud’s regard Iran as the ‘head of the snake’ and have pleaded with the US to attack it on many occasions under the Bush regime as well as the current US administration. As we’re all too aware a direct attack on Iran, would remove the cloak from the covert war already being waged and would be catastrophic to the countries waging it. Far be it for me to tell the BBC & the western media what the fallout would be from a military attack on live nuclear reactors, not that the consequences of any “collateral damage” are ever discussed seriously. Former UN weapons inspector Hans Blix stated military strikes would be ”a path to disaster rather than a solution” before adding that Iran “posed no imminent threat”. In 2006 Iran and Syria formalised a joint defence agreement to confront ‘common threats’. Any open intervention in Syria would not be welcomed by Iran and would clearly be viewed as an opening prelude to an attack on Iran itself. As I pointed out Russia & China are unwilling to back UN Security Council resolutions. Military planners in “The West” are using the second option to destabilise Syria. By bringing down the Syrian government and rupturing its strategic relationship with Iran and Hizbullah, the check mate position is in sight for the US and its Western, Gulf and of course Israeli partners. Nir Rosen recently wrote a detailed piece for Al Jazeera: “Q&A: Nir Rosen on Syria’s armed opposition” of which the closing paragraphs summarise how Israel will gain from this situation. When we take Syria in a wider context of the countries hit by the Arab Spring, we can clearly see new geopolitical boundaries being drawn. The so called “Islamist parties” (a term I dislike, but used for western discourse) have come or are likely to come to govern in Morocco, Tunisia and Egypt. Perhaps even in Libya if elections are ever held. What parties say when they are in opposition and what they feel obliged to do when they are the ruling governments are two different propositions. Rashid Ghannushi, the leader of Tunisia’s Al Nahda party has held quiet talks with the Israelis in Washington and has indicated that Palestine will not be a priority for the new Tunisian government. The Muslim Brotherhood in Egypt is dithering over maintaining existing peace treaties with Israel; the sticking point seems to be how many billions of dollars in aid they’ll receive for selling out. Thus far in a area undergoing rapid change, Syria is the player not playing the game, standing firm against the US and Israel on the one hand and the rising Saudi-Gulf axis on the other. Make no mistake “The West” is on the hunt for another war in the Middle East. War is profitable business; why else do you think military supplier BAE systems announced an 18% rise in profits yesterday, amidst a global recession. The essence of the campaign against Syria is ultimately Iran. Provocation with scientists being assassinated and the US navy on the Straits of Hormuz are a clear intention to goad Iran into retaliating and providing a pretext for the armed attack that many in Israel and the US want. So what are we to make of the situation in Syria? The UK, US and France have vigorously attempted to get a UN security resolution passed on the ever worsening conditions in Syria, a resolution which has been vetoed by both permanent UNSC members China & Russia. Almost every single player involved in this unfolding tragedy are engaged in the same manner of self righteous indignation. The same players of course that were prominent in the regime change in Libya. I’m no fan of the regimes in Damascus, Moscow or Beijing, but are they right to veto the resolution? But not for the whiter than white reasons they might claim. There is a far greater game being carved out in the Middle East, sadly our media (as well as Al Jazeera) is presenting it as a simple case of acrimony amidst the geo-political self interests of China and Russia, against the benevolent and kind hearted nature of UNSC members that supported the resolution. The resolution was of course itself driven by political machinations, by strategic demands and potential gains. It is downright perfidious to suggest that the real concerns of the western political powers are with the Syrian people. For example, last Friday’s attack on Homs was reported to have killed more than two hundred people, in reality the number was later revised to fifty five. Fifty five deaths too many, but when your only sources are “activists” that you are using to bolster another western intervention, the veracity of the information cannot be guaranteed. The apple hasn’t fallen far from the tree where the Assad’s are concerned. Basher’s father, Hafez gave the go ahead for the Hama massacre of February 1982 that left tens of thousands of Syrians dead. Do I condemn Assad and his regime, of course I do, whole heartedly, but not for the same reasons of self interest “The West” has. Why is there not a greater split amongst the Assad regime? Who are the “Free Syrian Army”? Who are the “Syrian National Council”? Who is arming the rebel factions? Why are Qatar acting as a military and media cheerleader? Why have the Saudi’s declared it recognises the Syrian National Council and what is their motivation in doing so? If this is correct, why are NATO involved in conspiratorial schemes of regime change, deemed illegal under international law ? So will direct intervention like in Libya improve the situation? These are the questions to which we should be demanding answers, yet they are not even being asked. The official narrative (same as Libya) is of the archetypal evil Arab tyrant, butchering his own people. These narratives are of course promoted by the very same people who want regime change in Syria. Can we say conclusively who is committing them all? The Arab League observer mission (not that it carries much gravitas, when tyrants from equally abhorrent murderous neighbouring states are doing the observing) stated it is not conclusive who is perpetrating the acts of terror in Syria. If we believe NATO and effectively the US is on the ground in Syria in some capacity, could they be responsible for some of them? The policy for Syria is being developed in America, of that there should be no doubt. Does it make it clearer now? It’s Iran and it always has been about Iran. 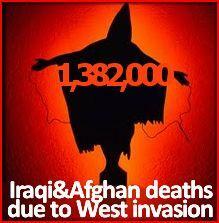 After the illegal invasion of Iraq for the purpose of regime change, “The West” quickly learnt that the blowback on their own shores from a restive Muslim population would cause immense problems. So how do “The West” engineer regime change now? The conditions for a similar strategy of tension are being unrolled in Lebanon, with a cargo containing huge amounts of US dollars, guns, special passports and credit cards having been seized upon arrival in Beirut this morning. Understand that whilst our politicians in the UK pontificate about the ever worsening condition of the Syrian people, the real drivers for the resolution come from the Americans. They are not concerned about the slaughter in Syria or anywhere else in the region. Their murderous intent of reshaping the region is polished with the veneer of respectability afforded by the useful idiots in the FCO and the media right here in the UK. For me, the motives are clear, and that’s why I will not support any UNSC resolutions bought forward by America and her cronies.